Naidu is unhappy with Budget 2018-19 and Jaitley's statement in Lok Sabha about 'inadequate' allocation of funds to Andhra. 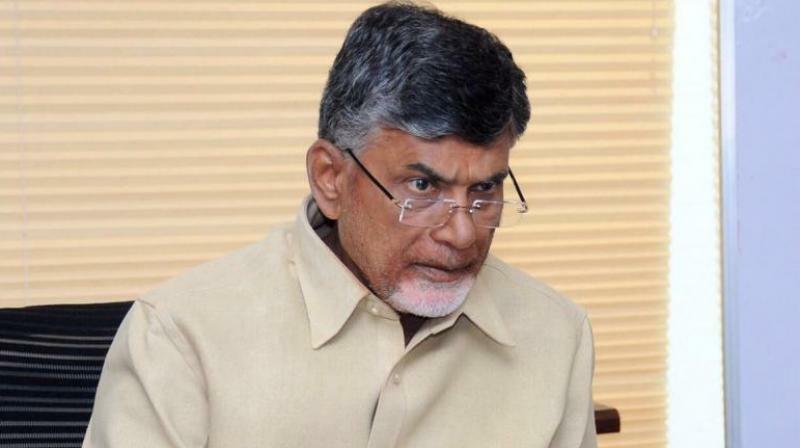 New Delhi: Unhappy with the Union Budget 2018-19 and finance minister Arun Jaitley's statement in the Parliament about 'inadequate' allocation of funds to the state, Andhra Pradesh chief minister Chandrababu Naidu reportedly told Telegu Desham Party (TDP) MPs that "the Centre is behaving in such a way that it is making people of AP feel that they are not part of the nation." Naidu is currently in Dubai, but had an emergency tele-conference session with the MPs, including two Union Cabinet ministers on Thursday to discuss further action. TDP floor leader in the Lok Sabha Thota Narasimham said, "Naidu directed us to keep up the protest in Parliament on Friday until the demands of the state are met." Arun Jaitley's statement in the Parliament was read out to Naidu during the tele-conference and the MPs suggested that TDP should continue the tough stance towards the Centre. "Naidu told us to protest in a serious way. The CM expressed unhappiness over the response from the Centre over the last 3-4 days," Narasimham added. Naidu also told the MPs that he will conduct another round of tele-conference with them on Friday. TDP will take a final decision on future action after the outcome of talks between state and central officials on revenue deficit and externally-aided projects, sources informed. Some TDP MPs, including Minister of Human Resource Development (HRD) of Andhra Pradesh Ganta Srinivas Rao, also suggested on Thursday that if required, TDP will walk out of the alliance with NDA. BJP Vizag MP and state unit president K Haribabu, however, maintained that the TDP will not quit the alliance at this juncture, though sources close to Naidu reportedly said that the TDP chief was extremely upset with Jaitley's statement and felt that Andhra Pradesh was being given a step-motherly treatment. "Each time you concede their demand, they come up with new ones. There is a limit to how much you can do for one state when you are having to deal with expectations from others too," BJP sources said, expressing unhappiness with TDP's relentless muscle-flexing. BJP also complained that while they appreciate Naidu's demands for the benefits of his state, most of which they have tried to accomodate, the TDP chief never takes into account the Centre's problems: fund constraint and the fact that India is a federal polity. "There is a strong possibility of position hardening on our side as well if he just goes on raising his ante," the BJP said. Finance minister Arun Jaitley had earlier said that the centre was sympathetic to the demands of Andhra Pradesh government and is finalising a fresh package in consultation with the state. Jaitley also said that officials from the expenditure department and the state government held discussions to work out a solution for funding externally-aided projects and on the issue of revenue deficit, on which Naidu had written to the FM. The finance minister did not disclose details but said that an arrangement had been worked out and the state officials had gone back to communicate the decision to the centre. While Jaitley made this statement, the Congress members were protesting in the Lok Sabha against his comments on Rafale and the TDP members were in the well, demanding special package for Andhra Pradesh. Amid the chaos, Jaitley said that most elements of the package that was zeroed in on at the time of bifurcation had already been given to Andhra. "The package involved several aspects, many of which have been implemented. Some of them are work in progress. We have given so far funds as promised for a large number of institutions which are being created because most of the institutions went to the Telangana state," he said. Jaitley said that funds will continue to be given for all those institutions. He also said that various ministries were discussing proposals related to railway and petroleum projects. However, these statements did not pacify the TDP members. On creation of the Capital, he said the Centre has made some payments for backward districts development and for ambitious Polavaram project through National Bank For Agriculture And Rural Development (Nabard) and added that Rs 4,500 crore have already been paid.